The much-loved Dr. Seuss children’s book The Lorax got a big expansion for its feature-length movie debut. The story has been translated for the screen before, back in 1972 as an animated TV special, but that was only 25 minutes long. For the 2012 animated film Dr. Seuss’ The Lorax, the filmmakers took a little liberty with the story to draw it out to 86 minutes. 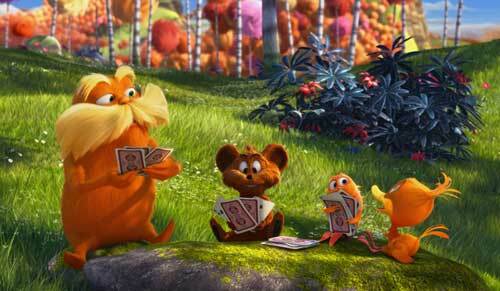 The nature-loving Lorax, voiced by Danny DeVito (Solitary Man), is still central to the film. He becomes the answer for 12-year-old Ted (Zac Efron, New Year’s Eve), who wants to win the heart of the girl of his dreams, Audrey (Taylor Swift, Valentine’s Day), by finding a real live Truffula Tree. But the endangered trees are protected by the grumpy but charming Lorax. Ed Helms (Jeff, Who Lives at Home), Rob Riggle (21 Jump Street), Jenny Slate (Alvin and the Chipmunks: Chipwrecked) and the irrepressible Betty White ( TV’s Hot in Cleveland) also voice characters in the PG-rated family film. “Serenade”, in which a love-shy Bar-ba-loot and a suave and confident Bar-ba-loot battle for the heart of their sweetheart, with the help of the Humming-Fish, Swomme-Swans and others. “Wagon-Ho,” in which two Bar-ba-loots take The Once-ler’s wagon on a ride they won’t forget. “Forces of Nature,” in which the Lorax tries to create the illusion of ominous forces of nature to scare The Once-ler out of Truffula Valley. “Making of the Mini Movies” with Illumination Mac Guff showing the joys and challenges of continuing the characters’ stories. “Seuss to Screen” about the translation of the book’s iconic style for the screen. “Seuss It Up!” tutorial about how to draw the Lorax, a Humming-Fish and a Bar-ba-loot in the Seuss style. “Truffula Run” game, in which the player must avoid obstacles while trying to pick up berries, in easy, medium and hard modes. Interactive “Once-ler’s Wagon,” in which, while the Once-ler is peddling his wares, users can choose an item for the curious forest creatures to mimic or play with. “Get Out of Town” game, in which the player must help Ted navigate through town on his scooter to make it to the Lerkim and meet the Once-ler. At the end of each level, Ted must solve an obstacle puzzle to go on, with three levels to complete to win. “Expedition to Truffula Valley” interactive feature, in which users can navigate within the valley to learn about how the characters and creatures come to life. Pocket Blu app, which allows smartphones to interact with the Blu-ray player.